The Diablo View Orchid Society meets the second Thursday of each month at 7:15p.m. at the Contra Costa Water District Building Board Room located at 1331 Concord Avenue, Concord, CA. Mary Gerritsen , Ph.D. currently works as an independent biotechnology consultant, her “retirement” after a long career in the pharmaceutical/biotechnology industry. However, much of her free time now involves orchids in some fashion or another. Mary has a large collection of miniature orchids, as well as numerous pleurothallids, paphiopedilum, bulbophyllum, and dendrobium species which she grows outside, in a cool greenhouse or in an intermediate greenhouse . In addition to growing orchids, Mary likes to see and photograph them in their native habitats, and this has led to expeditions to Australia, Papua New Guinea, Southeast Asia, China, various Mediterranean islands, Europe, Madagascar, South Africa, Mexico and other parts of Central America, many countries in South America, as well as various parts of the USA and Canada. In addition to her interest in orchids and their habitats, Mary has written, with co-author and photographer, Ron Parsons, a number of books on orchids including Masdevallias: Gems of the Orchid World; A Compendium of Miniature Orchid Species; A Bay Area Guide to Orchids and Their Culture; and The American Orchid Society Guide to Orchids and their Culture. Mary and Ron also coauthored a book on a genus of North American wildflowers: Calochortus; Mariposa Lilies and their Relatives. 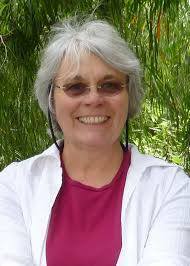 Mary is the chief financial officer of the Orchid Conservation Alliance, serves on the board of directors of Orchid Digest, and is a past president of the San Francisco and the Peninsula Orchid Societies. Along with Ron Parsons our speaker has written a book for the American Orchid Society, The American Orchid Society Guide to Orchids and their Culture, that every orchid enthusiast should own. It has just been published and some copies are on their way to California. They may not be here in time for Mary’s talk but she is willing to take checks for $25 and this will cover postage and also benefit the Orchid Conservation Alliance. So either bring your check book or cash along with your name and address to have it mailed to you. Everyone is welcome to attend and meet our speaker – email Eileen Jackson at eileen.jackson@att.com to reserve a seat. It is a CLOSED GROUP page, to which only members can post orchid related pictures and comments. To become a member use the button below and someone will contact you and invite you to the group.